When you watched the New Year’s Eve countdown and raised your glass to 2018, did you make any resolutions to put your finances first this year? Finance-related resolutions are the third most popular New Year’s resolution, following self-improvement and weight loss. (1) Millions of people strive to get out of debt, save more, or reach a financial milestone, whether that’s purchasing a vacation home or retiring. If you fall into this camp, how did you do? Did your resolution fall to the wayside as many do? The good news is that it’s not too late to make some headway on your 2018 goals, but you need to start now. 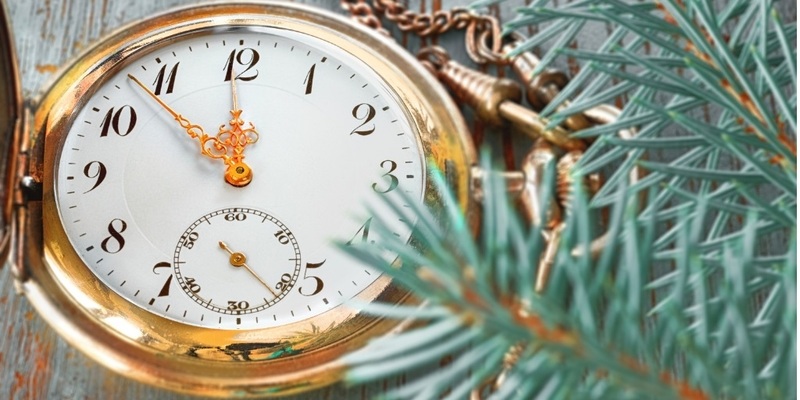 With Christmas just around the corner, take some time to get a jump-start on these 5 financial actions before 2019 arrives. If possible, max out your contributions to your 401(k) by the end of the year to make the most of your retirement savings. For 2018, you can contribute as much as $18,500 (or $24,500 if you are age 50 or older). Remember, these are your contribution limits, and any employer match is on top of this amount. You might also consider contributing to a Roth IRA. For 2018, you can contribute as much as $5,500 (or $6,500 if you are age 50 or older). Keep in mind that if your income is over $199,000 and you’re married filing jointly, you won’t be eligible to contribute to a Roth IRA. Finish the year strong by investing in your future! While every employer has different rules for the benefits they offer to their employees, many benefits expire or reset at the end of the year. You work hard for these perks, so be sure to use them up! Did you have good intentions of taking care of some dental work, blood tests, or other medical procedures in 2018? Now’s the time to take advantage of all your healthcare needs before your deductible resets. Dental plans in particular often have a maximum coverage amount. If you haven’t used up the full amount and anticipate any treatments, make an appointment before December 31st. Like your health insurance benefits, you’ll want to use up your FSA (Flexible Spending Account) dollars by the end of the year. Your benefits won’t carry over and you’ll lose any unspent money in your account. To see what expenses it can and cannot be used for, check the restrictions on your FSA account. If you’re retired, review your retirement accounts’ required minimum distributions (RMDs). An RMD is the annual payout savers must take from their retirement accounts, including 401(k)s, SIMPLE IRAs, SEP IRAs, and traditional IRAs, when they turn 70½. If you don’t, you may face the steep penalty of 50% of the distribution you should have taken. If you don’t need your RMD money to live on, consider donating the funds to a worthy cause, which could also lessen your tax burden for the year. To calculate your RMD, use one of the IRS worksheets. If you have taken the time and energy to create an estate plan, you’ll want to check in periodically to ensure all the documents are up to date and no major details have changed. Any significant life event is a good time to think about updating your estate plan documents. If you change any of the beneficiaries in one place, such as a life insurance policy, make sure that they are consistent with the other documents so that there is no confusion. If gifting is one of your long-term financial goals, it’s never too early to start planning for the legacy you want to leave your loved ones without sharing a good portion of it with Uncle Sam. Each year you can gift up to $15,000 to as many people as you wish without those gifts counting against your lifetime exemption of $5.6 million. If you’ve yet to gift this year or haven’t reached $15,000, consider gifting to your children or grandchildren by December 31st. If you made a charitable contribution in 2018, you might be able to lower your total tax bill when you file early next year. It can be especially advantageous if you donated appreciated securities to avoid paying taxes on the gains. If you itemize deductions, find and organize any receipts you have from your donations to charities, whether it was a cash, securities contribution, or another type of gift. Do you need to take any of these steps before the ball drops on New Year’s Eve? Cornerstone Capital Advisors would love to help you finish the year off strong and set you up for a successful 2019 by aligning your financial resources with your values and goals. Call us at (330) 896-6250 or email [email protected]. Grey Kennedy is a Director of Fiduciary Services and Lead Advisor at Cornerstone Capital Advisors with over 20 years of experience in financial services, specializing in institutional retirement plans. Grey received his bachelor’s degree in business administration and marketing from the University of Colorado at Boulder, and also holds the Accredited Investment Fiduciary™ (AIF®) and Certified Health Savings Advisor (CHSA®) designations. He is an active volunteer with Junior Achievement and enjoys giving of his time with that organization to support financial literacy for kids. Grey resides in Avon Lake, OH with his wife, Cindy, and their three children. He volunteers for the local community soccer board and enjoys playing golf, hiking with his dog, and traveling with family and friends. Learn more about Grey by connecting with him on LinkedIn.